I think it was W.C. Fields who first said you should "never work with animals or kids". Well, it's not as bad as you think, it's largely about approach and how you use your camera that matters. I've worked with young kids on shoots for magazines, editorials, fashion labels, portfolio shoots and headshots and although it's never easy there are some simple things you can do to get a really good result at the end of the day. Shooting 3-5 year-old's can be a problem because you have limited time and extremely limited attention span. I find getting on the floor and sitting with them for a few minutes to get them comfortable helps a lot. Asking them questions about their favorite things to do will give you some things you can use during the shoot. Asking about their pets or favorite toys also gives you some great information when you can say "imagine GiGi is sitting on top of my camera making funny faces at me" will get a laugh or a big smile, and then asking them to show me the funny faces they can make will relax them and get them in a good mood. 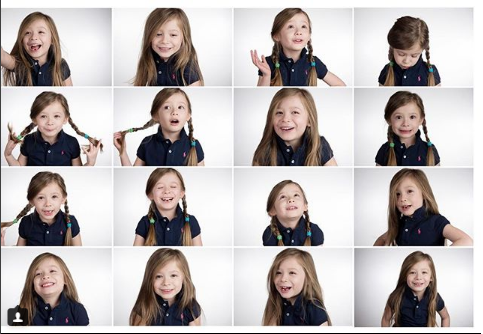 A collage of serious and fun shots with funny faces makes a really good gift for the parents - I typically give them a 4x4 grid of these shots and often that's the one the parents will frame and hang on the wall. I like to start on the floor getting some sitting shots, or lying down just to make it easy for them, and I'm lying down in front of them. Make sure you bring your lights down to match the height you're shooting at. Then we might move to a chair or standing, and running across the frame or towards the camera or a bit of jumping will keep the energy up and give you some more creative shots. Then when you ask them to see how long they can be as still as a mouse they'll usually go with it because it's a game. Another thing I often do when they're getting tired of the shooting is say "OK - we only have 10 more shots to do - can you count them down with me" they like it because they can see the end coming and like to show off their counting skills. And often you'll get 20 shots in this last set, not 10. I typically shoot in studio and the best wrangler is usually Mom or Dad standing behind me looking over my shoulder making funny faces to keep them engaged and happy. For photographers - using flash and shutter speeds of 1/200 helps freeze action and continuous focus is a must. The key is short 5-7 minute shooting sessions, a quick change of outfit, then another bracket, and you can get up to about 5 sets but that's about all you're going to get. Kids will want some snacks during the shoot but try to avoid cookies or chocolate as you'll be spending hours in photoshop cloning crumbs from their faces and clothes. If there's more than one., rotate them rather than try to complete one, then the other. Mixing it gives them a small break between sets. Shoot as quickly as you can and keep the fun going - and high five's after every set. Welcome to our Blog featuring our shoots, Behind The Scenes shots, and details of setups for photographers.